Answering the Question: What is Art? 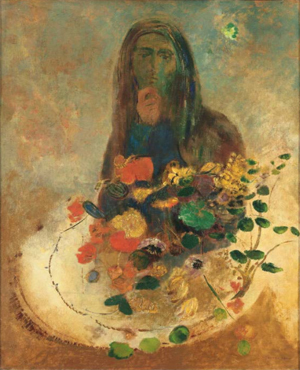 Odilon Redon, Mystery, c. 1910. Oil on canvas, 28 3/4 x 21 3/8 inches. The Phillips Collection, Washington, D.C. Acquired by 1925. What I love about What is Art?, one of the classes offered this semester by the Phillips’s Center for the Study of Modern Art, is the opportunity it provides to form a real connection with the artwork I see every day, yet so often find myself contemplating only in passing. During our second gathering, Director of the Center for the Study of Modern Art Klaus Ottmann took our class of about 20 to one of these works – Odilon Redon’s Mystery. While I’ve always found this painting intriguing (and perhaps a little haunting), I was amazed at the fresh eyes with which I observed it after taking in my classmates’ perspectives. The class syllabus warned that we would leave with more questions than we came in with, and it wasn’t an exaggeration. In the full hour that we spent in front of Mystery, questions were raised from the broadest to most minute topics. Is this person a male or a female? Portrait or self-portrait? What is that bright green spot in the top right corner? Is there something hidden in those flowers? One classmate saw a self-portrait of the artist holding not flowers, but his painter’s palette in his left hand. Another read the contrast in hand and face color as an indication that this is a portrait of a man holding a mask to his face. While some saw the brightness and pop of the colorful flowers in deep contrast to the muted palette of the rest of the piece, others saw echoes of the drabness in the background manifested in the drooping and dying flowers of the foreground. My own thoughts fixated around the stark contrast in styles between the foreground and background; it looks almost as if one artist created a somewhat dreary portrait and a completely separate artist came along and added the flowers later. The hour of observation went quickly, and I left vowing to return. What are some of your own impressions? Who owns the rights to documentations of performance art?